As of this writing, I’m two-thirds of the way through the Milieu Trilogy, the Italian director Fernando Di Leo’s back-to-back cycle of nasty early ’70s Tarantino ur-texts. In my movie maniac days, before professional responsibilities got in the way of slamming four or five films a day, I steered clear of Italian crime flicks (also known as poliziotteschi) in favor of their more famous contemporaries, the spaghetti Westerns and the stylish giallo thrillers. 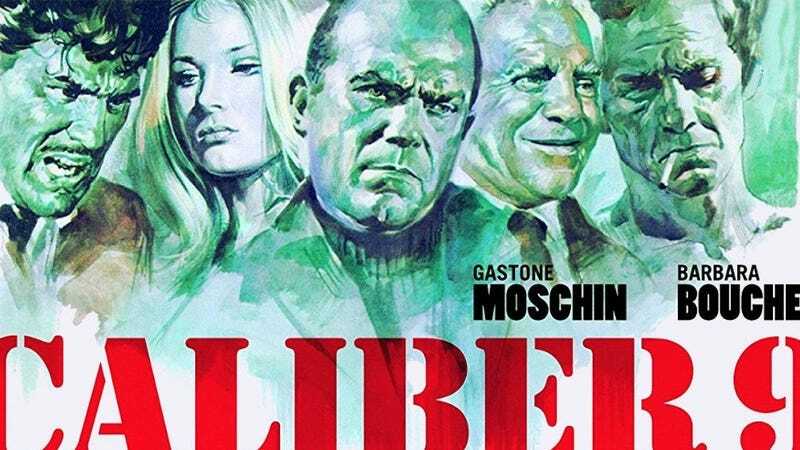 But now I dig it: the angry Italian politics, the cheap suits, the salesman-looking psychopaths who pistol-whip each other with wartime Lugers and drive around recklessly in tin-can compact cars, the all-consuming corruption. Caliber 9 and The Italian Connection (both 1972; the latter is known by a variety of titles) are sadistic and intricately plotted variations on the same themes, the blame game and the rotten syndicate. Caliber 9, an adaptation of a novel by the Ukrainian-born crime writer Giorgio Scerbanenco, centers on a bullet-headed Milanese ex-con (Gastone Moschin) who’s suspected of stealing $300,000 from a kingpin nicknamed “the American.” The opening sequence alone is a mean piece of business, with a handheld camera squirreling after a psycho mobster (the Jay Leno-chinned Mario Adorf) as he tortures and kills thieves with the baroque-prog main theme wailing on the soundtrack. It might seem like (literal) overkill, but it sets up instant tension when Moschin’s character is introduced minutes later being released from prison, with Adorf waiting for him at the gates with some cronies. The set-up is classic existential noir: Killers want our man to lead them to the hidden loot, but he still insists he didn’t do it. The drizzly Italian winter scenery imbues it with a compelling chilliness, a sub-flavor of Jean-Pierre Melville, especially in the relationship between the protagonist and an old buddy of his who lives by a code. The Italian Connection, which is also set in Milan, is a different animal, more diffuse and in some ways less formally accomplished, but more dramatically ambitious. In a complete reversal of his role as a scenery-chewing antagonist in Caliber 9, Adorf plays a local small-time pimp who becomes an unwitting patsy for a gangland heroin heist, with a couple of American hitmen (Henry Silva and the John Ford regular Woody Strode, supposedly the inspirations for Pulp Fiction’s Vincent and Jules) and a bunch of blame-passing Milanese mobsters on his tail. For more than half of its running time, The Italian Connection plays in part like a self-effacing parody of the Italian crime genre, winking at its own clichés. But the comic surface hides a savage instability; unlike Caliber 9, this one never pretends that there could be honor among thieves. And the police—who have a chorus-like presence in Caliber 9, via a couple of cops with opposite political views—aren’t even a factor. As the mob gets more desperate to catch him alive, Adorf’s character devolves viciously from a comedic character into a cornered animal. In the defining moment of the film (which comes in the middle of a crazed chase sequence), he furiously clings to the front of a swerving delivery van and smashes his head through its windshield to get at the driver. The finale is staged in a dump, with Adorf maniacally operating a junkyard claw to mangle a gunman. I’ll get to the third of the Milieu films, 1973's Il Boss, this weekend. But for now, the appeal of Di Leo seems to be in the exact (and ultimately crushing) gearing of his characters and plots; his visual style is a less inspired, sometimes flat or clumsy. I had the opposite reaction with another sadistic gangster movie of similar vintage, the 1966 Japanese film By A Man’s Face Shall You Know Him. (It goes by a plethora of alternately translated titles, including History Of A Man’s Face and A Man’s Face Shows His Personal History.) Set in mostly the late 1940s, it focuses on a bloody turf war between locals and caricatured Korean hoodlums, presented as a flashback by a scar-faced doctor (Noboru Ando, a real-life yakuza who became an actor after going straight) as he operates on a man from his past. It’s not exactly sparkling material, but I was drawn in by director Tai Katô’s extremely unusual camera style, which largely eschews camera movement in favor of a staccato of static widescreen compositions that are claustrophobically cropped or framed from extremely low angles. It gives the camera an fatalistically alienated point-of-view. Katô is a director I know only by reputation; like Di Leo, he’s a subject for further inquiry.